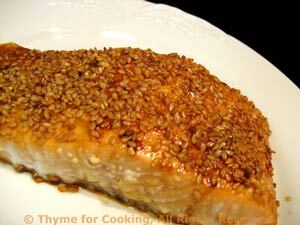 Sesame Crusted Salmon, Thyme for Cooking easy gourmet recipes. The quesadilla is not a traditional starter for an Asian meal... So this is an eclectic, multi-cultural dinner. When I buy tortillas, it takes several meals to use them all... Wrap in film and refrigerate, we'll be using them. The salmon, orzo and broccoli are all quick and easy, with the work done while the quesadilla bakes. Heat oil in nonstick skillet. Add shallots and 2 tbs water. Cover and cook for 5 minutes over medium heat. 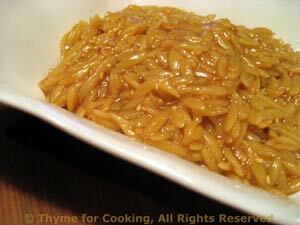 Uncover and continue to cook until browned and caramelized, stirring occasionally, about 15 minutes. Spread the shallots on the tortilla. Lay the ham on the shallots. 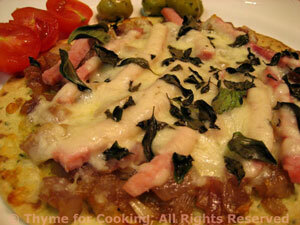 Sprinkle with cheese and top with herbs. Bake, 400F (200C) for 8 - 10 minutes, until hot and cheese is melted. Remove, cut into wedges and serve. The sesame crust adds just the right amount of crunch to these flavorful salmon filets; roasting keeps the crust nicely in place. Mix soy sauce, sesame oil, ginger and brown sugar in a small bowl, whisking until sugar and ginger are dissolved. Put salmon on a baking sheet with a lip. Divide soy mixture and spoon over salmon, coating evenly. Sprinkle sesame seeds on top of each filet, pressing them in lightly. Bake in 400F (200C) oven for 15 - 17 minutes, depending on thickness. Salmon will be done when it flakes easily, slightly pink in the center is fine. The sesame coated top should be a golden brown when done. Remove and serve. Broccoli is often included in with beef or chicken in stir-fries, but it's excellent stir-fried on it's own as a side dish, as well. Plus it's bright green color looks lovely on the plate. Heat oils in a nonstick skillet over medium-high heat. 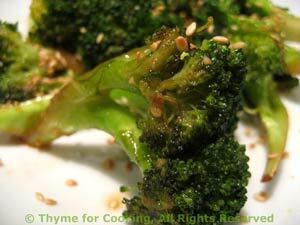 Add broccoli and garlic and stir-fry about 5 minutes. Add soy sauce, chicken stock and ginger, reduce heat to low, cover and simmer 5 minutes. Uncover and cook off any liquid. Broccoli should be crisp-tender.